Confession: I mainly stick to mindless Bravo TV. Looking for an on-demand or Netflix series to watch. The last one I really watched was the Sopranos. I saw a few Mad Men and some Dr. Who too. If my teens can watch it with me – bonus. Any suggestions? I LOVE Facebook and my friends and their willingness to interact and crowdsource with me. This responses were to fabulous to keep to myself on my personal page, I felt it needed to be shared via a public channel (aka my blog). And FYI in the past 2.5 weeks since this post, my hubby and 15yo son and I are on Season 4 of Breaking Bad! Christin: Take this trip into the Wayback Machine with me….behold! The Love Boat. The Six Million Dollar Man. The Hulk. Fantasy Island. The A-Team. Hart to Hart. Charlie’s Angels. Wonder Woman. China Beach. Riptide. Bionic Woman. Quincy, M.E. The Equalizer. Magnum, P.I. Knight Rider. Silk Stalkings. Remington Steele. Moonlighting. Cara: Not teen friendly but Scandal, Revenge are both good. ABC Family – Switched at Birth and the Fosters are both teen friendly. Army Wives. Linda: Orange is the new black. It’s a Netflix show. Wyndie: Way too many on Netflix to name. Everyone likes Breaking Bad. Debbi: Walking Dead!!! Love it! Marla: When we were sick i watched all the seasons of American Horror Stories. Linda: I want to watch breaking bad too but afraid I’ll get hooked and do nothing else. Tina: Funny Greta. 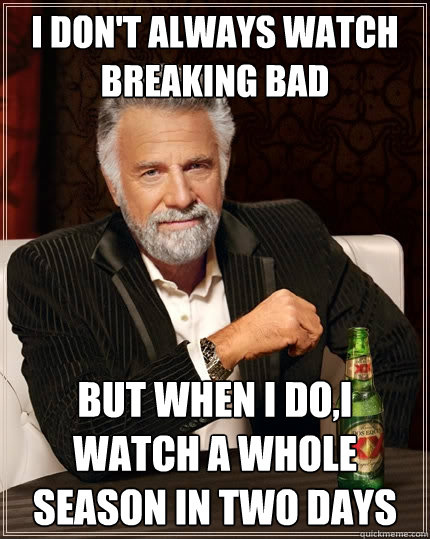 We’ve got Breaking Bad playing right now! It seems dark and odd at times, but it seems good so far. Michael: Foyle’s War is on Netflix. Begins before WWII and every episode is full of intrigue and is extremely accurate historically! The acting is outstanding and if you start the series it may consume you for many more cold winter nights! Christie: Jericho or Fri Night Lights!! Tim: I’ll second Foyle’s War. Darned good series, as is usual with British TV. Excellent acting, great plots and well-researched costuming and sets. Dionne: Farscape has muppets in space. Wyndie: Greta, I’m stuck on Real HW of BH and Vanderpump Rules. Can’t get enough of those! Empress: just finished season of Orange is the New Black!!! Loved it. Can’t wait for new season!! Fausta: ENGRENAGES – police in France, great show. Kerri-Anne: Breaking Bad and Orange is the New Black – I never watch TV and I cannot stand reality shows…fell into these by accident and they are different and intriguing for many reasons….never ever thought I would like Breaking Bad…..WHOA…is all I can say! Tabita: Scandal was really good. Herb: Scandal is what I am watching. Jaclyn: I’m watching Bones right now. Mark: No question- Breaking Bad. Steve: Klondike was on Discovery if you have on demand. More history & scenary, good plot. Shelli: Orange is the New Black-not really teen friendly. John: Try Foyles War – BBC series set at the start of WWII. Very good! Doug: Deadwood, Breaking bad, Weeds, BBC – ashes to ashes- Enough said. Jackie: Treme was amazing, homeland too! Susan: The Americans on fx is fantastic. So is Walking Dead. Can’t get enough. Aura: I miss when Bravo used to be brainy and artsy. Basil: If you’re Amazon Prime, Suits is good (not on Netflix streaming). Also on Prime, there’s Justified (not as teen-friendly). White Collar (Netflix) is also good. Breaking Bad, too, but violent. Burn Notice. Eureka was pretty good. And Last Man Standing (Tim Allen’s comedy) is now on Netflix. Jeanene: If you haven’t watched Friday Night Lights, it is a great one to watch with the kids. We loved it! Sharon: Top Gear, the british version. Debbie: We just power watched House of Cards. Really good series. Karen: Damages is good. So is House of Cards. Dave: I’ll throw in one I don’t think I see above, because it’s about 10 yrs old. If you never watched it, The Wire tops them all, imho. Otherwise, you can’t go wrong with Breaking Bad.